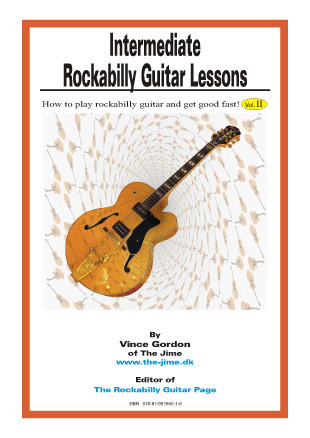 Intermediate rockabilly guitar lessons are a big subject and this book covers tons of stuff. To say it in headlines:Learn new rockabilly guitar riffs in the styles of Scotty Moore, Brian Setzer, Grady Martin, Mickey Gee, Carl Perkins, Cliff Gallup and others. Learn scales and how to use them in rockabilly. Learn rockabilly chords and how to pick them. Learn a complete 48 bar rockabilly guitar solo in A. It's written down in tab and notation AND recorded in a MP3 with backing band (From the Jam With The Jime CD). It's also explained bar for bar why the solo is put together like it is. Learn a complete 24 bar solo in E with tabs, notation, MP3 and explanation. Take it apart and make up your own new solo! Learn how to do Travis Picking and the key to improvising on it. 36 bars with tabs, notation, MP3 and explanation. Learn many different ways to "twang" - Duane Eddy style. With MP3 and explanation. Learn how to construct a rockabilly guitar solo! If you haven't learned how to improvise, playing rockabilly lead guitar will never feel natural or easy. That's why the teaching is centred on improvisation. It's written in everyday language, but don't let that fool you. It IS based on music theory. The method of learning is just far less complicated and gets to the point. IMPORTANT: It is recommended that you get the "Jam With The Jime CD" with rockabilly backing tracks to play along to, as the 48 bar solo is played to a track from that CD. You get a total discount of 21% if you buy both the CD and the eBook. If you're a beginner this book is not for you. I refer you to "How to play rockabilly guitar and get good, fast!" instead. It doesn't have transcriptions of complete classic solos.